2010 Come to Us With Your Research Needs! This blog posting does not have current information; email libref@loyno.edu for updated information. -	Come to the library 9am-9pm Monday through Thursday (and 9am-5pm Friday) and talk with a real live librarian. We reopen with limited hours on Monday, January 3 (Monday, January 3 – Saturday, January 8: 8am – 6pm, Sunday, January 9 noon – midnight) and resume normal hours on Monday, January 10. The Monroe Library is ready to help with any research needs. Good luck with finals, and have a great winter break! Women in Early America is one of my favorite subject-specific encyclopedias. This single volume contains biographical and topical entries pertaining to women and their experience in early America. Like most great reference books, this encyclopedia is a great place to start research. Each entry has suggestions for further reading, which is useful for identifying the most relevant and renowned materials on the given topic. The articles are accompanied by a motley array of images, excerpts from primary and secondary sources, and appendices. There is also an annotated bibliography divided by topics, such as the American Revolution, arts and letters, Native American women, and social life and customs. 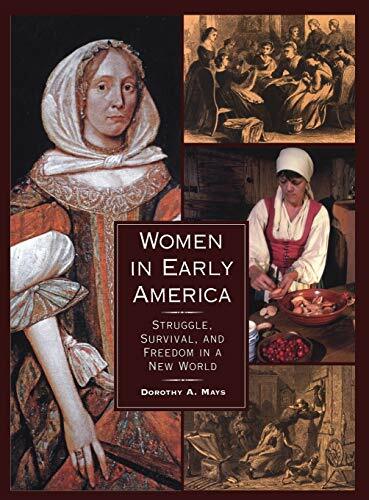 In addition to having the qualities of a great reference book, Women in Early America is remarkably engaging. The author, Dorothy A. Mays, recognizes that the limitations of the historical record pose a challenge for conducting research about women. May attempts to address the diversity of women’s experience during this era. Famous females are featured alongside lesser-known women. Geography, nationality, religion, and social class shaped how women lived. Many of the topics describe aspects of women’s everyday life, including birth control, death and funeral customs, hobbies and games, hygiene, reputation, and shopping. The process for churning butter, brewing beer, filling a mattress, and other laborious work are detailed in an appendix on common household chores. All of these details combine to create a mosaic of women’s experience in early America. You can find Women in Early America and other print reference materials in the reference section on the first floor. As part of the Managed Hosting team’s initiative to improve our environment and take advantage of new technologies, we will be undergoing a project to swap out our existing core switches in both the VA2 and VA3 datacenters. This swap will enable us to upgrade to our vendor’s latest technology switches while expanding our capacity so that we can better support your growth. The maintenance work is scheduled to happen on Tuesday December 28th from 12:00 – 8:30 AM Eastern Standard Time (EST). Why is the maintenance window 8½ hours instead of the usual 4 hours? This project is larger in scale than most of the maintenance work we do during our regular windows. Our standard maintenance generally requires adding or replacing a card or upgrading code whereas this maintenance requires the replacement of both the A & B side switches. While the work itself should not take the full 8½ hours, we have built a buffer into the window to resolve any problems that might arise and/or enact a rollback plan if needed. Why is the work being done on a Tuesday and not during the Friday morning window? Based on our maintenance policy, any scheduled non-emergency maintenance that requires more than the four hours allotted during a regular Friday window will be performed during a more appropriate window. Will my site be offline the entire window? The Managed Hosting Engineering Teams will take all necessary steps to minimize the impact to clients. However, because the maintenance requires redirecting traffic in addition to physically removing equipment, clients may experience extended periods of latency and/or packet loss at anytime during the entire window. Our recommendation is to notify your end users to prepare for the site to be offline for the full eight and a half hours. They may find the site available sporadically but users should not plan to do any work as it may not be saved if the site becomes unreachable. Does my institution have to be included in this maintenance? Yes. As the maintenance is datacenter wide, it will include all clients hosted within the facility. Will I need to make any changes on my network? No, there is nothing that needs to be done by your institution and no changes need to be made to your network. There will be no modifications to our current configurations or IP schema during this change. You are currently browsing the Library Lagniappe blog archives for December, 2010.